The Greek sophist Libanius recounts in his autobiography the struggle that he faced when he returned to his hometown of Antioch in the middle of the fourth century, intending to teach there after years abroad. At first confined to teaching in his home to a small group of students, he eventually acquired a classroom at the edge of the marketplace (agora), and then finally the coveted right to lecture at the bouleutērion, the city hall, where he gained numerous students, and his authority increased exponentially. Libanius's manipulation of Antioch's places also reveals itself through the numerous interactions that he narrates with local and imperial officials, from the praetorian prefect Strategius to the emperor Julian. In particular, the power dynamics of attendance (or avoidance) at strategic locations throughout Antioch demonstrate the authority that Libanius was able to wield through his control of the city's topography. In these same decades, as many as four Christian leaders concurrently claimed the title of bishop of Antioch, each elected by a different Christian faction. This led to sharp and long-lived competition about who could preach in which of Antioch's church buildings (and who was exiled altogether). This chapter will examine Libanius's competition for Antioch's most prestigious teaching places, and the power attendant on teaching in the prime bouleutērion classroom, setting the stage for comparisons with Christian leaders' competition to control the city's most prestigious preaching places. Together the Christian disputes and Libanius's narratives reveal the complexity of the spatial power dynamics in fourth-century Antioch. Roman leaders of all types took advantage of the benefits that came from controlling identifiably powerful places, in terms of the numbers of people they could influence and the local authority they would gain. While Christian leaders were busy competing over Antioch's churches, Libanius suggests that the city's teachers likewise competed not only for students, but also for the best classrooms in the city, where they could gain visibility in areas with large audiences. Unlike the churches, however, which at least have some extant textual and occasionally even archaeological evidence for when and where they existed, Antioch's classrooms are less recoverable, not least because many of them would have been rooms that were also (and sometimes primarily) used for purposes other than teaching. Roman education consisted of several different levels, from the basic reading and writing skills that the elementary didaskalos taught to the more advanced study offered by the grammarians to the elite higher education provided by teachers of rhetoric. The locations of education at any of these levels were quite varied and are difficult to reconstruct with much clarity. When Stanley Bonner gathered much of the textual evidence for Roman teaching places, he lamented the dearth of evidence: "There is scarcely any part of the study of Roman education in which precise information is so difficult to obtain as that which concerns the localities and premises in which teaching took place." As discussed below, more recent excavations, such as in Egypt; further analysis of textual references, including newly available papyri from Oxyrhynchos; and material culture, such as scenes portrayed in vase paintings, have led to some more detailed academic discussions, although much still remains unknown. Raffaella Cribiore has outlined the numerous possibilities for teaching places in the Roman world: "Besides occupying a private or public building, a school could have been located within the perimeter of an ancient temple, in the cell of a monastery, in a private house, or even in the open air, at a street corner or under a tree." New evidence for what appear to have been classrooms has come to light from large auditoria in excavations in Alexandria and from a room with poems painted on the wall in excavations in the Dakhleh Oasis of western Egypt. Likewise, parts of some Roman baths, the forum of Trajan in Rome, and various stoai appear to have had educational uses. While some urban centers, like Antioch, had public teaching places and publicly funded teachers, most education in the Roman Empire seems to have taken place in more individually owned settings, including especially the homes of wealthier Romans. Other teachers seem to have taught their students in their own homes, as Libanius mentions doing when he first returned to his home city of Antioch (Or. 1.101). Still other teaching places seem to have been public multipurpose rooms. Suetonius, for example, mentions the possibilities of teaching in a patron's domus, in the open air, in open roofed areas in front of shops or homes, and in one's own house, which Robert Kaster understands to be among the best of Suetonius's options. Augustine refers to curtains on the doors of grammarians' schools, suggesting makeshift classrooms that would only be classrooms while the day's lessons were actively in session. Because of classrooms' often private and transitory nature, it is difficult to learn much about the actual locations of the majority of teaching places in the Roman Empire-with some important exceptions. Some recent archaeological discoveries from Alexandria and Libanius's textual evidence from Antioch suggest that in these two cities there seem to have been large auditoria available for publicly supported Roman education, and there is textual evidence that there were large lecture halls for teaching law in fourth-century Berytus (present-day Beirut, Lebanon). Athens seems to have had private lecture rooms away from the center of the city in late antiquity, and there has been speculation that recently unearthed buildings on the slope of the Areopagus in Athens were used by teachers, and that their large halls were theatra for teaching and lecturing. Athens further provides evidence that the house belonging to Julianus, and then Prohaeresius, the city's official sophists, had a marble lecture room for classes and declamations; and Himerius mentions a small lecture room in a temple to Hermes and the Muses in Athens where he learned to declaim. Thus, there are enough references to places of learning in the Roman Empire to demonstrate the variety of types of classrooms, even though there are relatively few examples of specifically identifiable locations in any particular city. Not surprisingly, our information about teaching places in fourth-century Antioch comes primarily from Libanius's numerous writings. Libanius visited his native city in 353, and he returned to stay permanently in 354. Following some struggles, he was offered the city's chair of rhetoric and recognized as the leading sophist in the city. Oratio 31 reveals that Libanius had four other teachers working under him as his assistants by 361, when he addressed Antioch's city council on their behalf (Or. 31, esp. 31.8). By that time Libanius was well established in the city and was teaching in the classroom that he most coveted there, a lecture hall that was part of the prominent city hall. Libanius depicts this classroom as "a roofed theater and four colonnades (stoai) surrounding a courtyard in the middle that had been made into a garden" (22.31), which he used for "his students' declamations and for regular classes." According to Cribiore, "It was a monumental room with an imposing entrance and, on the opposite side, there were two seats, one of which was [the sophist's] chair (thronos)." The size of the teaching space, the formal thronos that it contained, and the prominence of its attachment to the bouleutērion all contributed to the authority of the teacher who controlled this classroom. Libanius also provides some information about other teachers and teaching places in Antioch, although more about the former than the latter. In the year 388, for example, the city of Antioch sponsored a new Latin chair, which brought Libanius competition, as previously he held the only chaired teaching position in the city. Libanius also mentions many teachers who were beneath him in status, pay, and prestige in the city. Although he complains that Constantinople was draining all the good teachers from Antioch, his narration of his days before he became the city's chaired sophist reveals that a sufficient number of teachers remained in the city to create competition for students and teaching places. The evidence for places of Roman education is rather sparse in comparison with some other aspects of daily Roman life, but Libanius remains a fruitful source of information about the Antiochene competition over classrooms. Libanius was one of Antioch's most famous fourth-century citizens. Born in Antioch in 314, he left to be a student in Athens in 336. Four years later he moved to Constantinople to begin teaching, but he left after only two years, arriving in Nicomedia by 344 to become the city's sophist, a position that he held for five years. In the year 349, Libanius accepted an official chaired position in Constantinople and returned to the eastern capital for five more years. Apparently homesick for Antioch and not fond of Constantinople, Libanius returned to his hometown for a visit in 353, and in 354 he left Constantinople permanently for Antioch, where he lived the remaining forty years of his life. Much of our knowledge of Libanius's life comes not only from his letters and orations, but also from his autobiography, which details many of the prominent events in his life, including his travels, the ill health that plagued him, and his encounters in Antioch with the emperor Julian. In this text, most of which (Or. 1.1-155) first circulated in 374, Libanius places a strong emphasis on his struggles to gain and maintain control over a prominent place in Antioch from which he could teach a large audience. Combined with his discussions of other cities and their (poor) educational facilities, Libanius relates his efforts to construct and claim significant places in Antioch. From the beginning of his autobiography, Libanius establishes the importance that he placed on education and study, and he consistently locates this conversation geographically, in terms of less worthy places that competed for his attention. He laments his early indifference to studying, remembering that his mother indulged him more than he later wished she had, and did not press him to study diligently despite the money that she paid to educate Libanius and his two brothers (Or. 1.4). He explains that as a result he and his brothers "spent most of the year in the country (agros) rather than in study (logous)" (1.4). The leisurely countryside emerges immediately from Libanius's narrative, in opposition to the urban place of study. As he matured, Antioch rose further and further in his estimation until it surpassed not only the countryside but also the major centers of Athens and Constantinople in the high quality of its educational opportunities, and thus its civility and other qualities that Libanius considered to be the fruits of paideia. Libanius's carefree childhood did not last, however. At the age of fifteen, as he recounts, "a sharp love of study" took hold of him and reshaped his life, and thereafter "the charms of the country were neglected: the pigeons were sold . . . ; the horse competitions and everything of the stage were renounced"; he claims that he "astonished both young and old" with his preference for his studies over the country and the spectacle of the theater (Or. 1.5). Despite newly clinging to his books (instead of to other places of entertainment in the city) and having a good teacher, however, Libanius claims that he still did not attend lectures as much as he should have (1.5; 1.8). Just as he outgrew his childhood apathy toward studying, though, so too he eventually developed a renewed desire to attend lectures, which required him to frequent certain places and avoid others. After the death of his promising lecturer, Libanius attended several other teachers' lectures, but found them all wanting. Rather than frequent inferior lectures, he chose to study more elementary material under a teacher who better engaged his interest; Libanius claims that he attended this teacher's classes regularly: "Indeed I devoted myself entirely to this [teacher], such that I would not even depart from him after the students had departed," following him "even through the agora" (1.8). Luke Lavan notes the significance of the agora in fourth-century Antioch, and that the company one visibly kept there reflected one's social status. Libanius's identity was strongly tied to his education and then to his own role as a teacher, and for him both of these were intimately connected with where he went. In 354 Libanius returned to Antioch from Constantinople, a city that he describes as corrupt with a population that "abounded in the pleasures of the theaters" rather than in education, and from Nicomedia, a city that he much preferred to Constantinople and whose citizens he characterizes as reveling "in the fruit of paideia" (Or. 1.52). Libanius remembers that in Nicomedia he had given lectures everywhere in the city, even in the public baths: "Thus the whole city had become a mouseion for us" (1.55). Despite this idyllic image of his time in Nicomedia, Libanius left for Constantinople and Antioch, where he found that, in contrast, the whole city was very clearly not his lecture room, and he had to struggle to attract students and gain control of classrooms whose location granted a level of authority and visibility that he found acceptable. In his autobiography, Libanius recalls the sharp contrast that he experienced between 353 and 354 with respect to the lecture halls of Antioch. When he visited in 353 from his post in Constantinople, he carried enough prestige to speak as a guest in the bouleutērion. Not only was he warmly welcomed on this occasion, but he portrays an overwhelmingly enthusiastic crowd that attended and cheered his public declamation: "First of all, it was not necessary for anyone to gather each one with flattery, but rather it was sufficient that they knew I would speak. Then, without waiting for the sun, they crowded the bouleutērion, and for the first time it appeared to be insufficient" to hold the throngs of people (Or. 1.87). Although we should expect rhetorical exaggeration in this self-aggrandizement, Libanius wrote this autobiography in this same city where the events took place, and it seems plausible that he was genuinely honored on his visit by a warm reception. The crowd's enthusiasm only grew during the speech itself, according to Libanius: "How could I adequately speak about the weeping over the prologue, which not a few left having learned thoroughly, and about the frenzy concerning what followed" (1.88). He claims that the crowd kept interrupting him, demanding that the emperor release him from his position in Constantinople to return to his own people, and that even after his speech they followed him around the city, each one wanting to touch his body (1.88-89). While this is Libanius's idealized reminiscence of decades gone by, the story nevertheless highlights the significance of Antioch's bouleutērion as the city's most prestigious place for public speaking, a site associated with powerful aristocrats and large audiences. When Libanius returned to live in Antioch, he relates that he did not receive the same welcome that he had during his earlier visit. Libanius narrates that his visit in 353 visit already created competition with "a certain Phoenician" teacher who was "admired for his skill" (Or. 1.90). Despite the fact that at that time Libanius was only visiting from his position in Constantinople, the Phoenician teacher not only returned to Antioch to claim his students before they left to follow Libanius, but, Libanius claims, immediately "began a fight" with him (1.91). When Libanius arrived in 354, he came as a teacher who would be competing for students with those who already lived and taught in Antioch, and he leads his reader to believe that he constituted a severe threat to those who were established in the city before him. Dayna Kalleres notes that Libanius's discovery of a dead chameleon in his lecture hall led him to conclude that one of his competitors had put a curse on him, highlighting the competition that he imagined surrounded him (1.243-50; 36). Libanius claims that in the face of his own successful teaching, his rival's "followers were again withdrawing even more readily," suggesting that they became Libanius's students instead (1.110). Although Libanius was born into a curial family, most of the family's property had been confiscated in 303/4 after the revolt of Eugenius, and his mother sold what remained while Libanius was abroad in Athens. When he returned to Antioch, he narrates that in the beginning he did not teach publicly, let alone in the bouleutērion itself: "I was at home with my fifteen students," most of whom he claims had come with him when he moved from Constantinople (Or. 1.101). In what was a far cry from his jubilant performance in the bouleutērion in 353, Libanius blames those teachers with whom he competed for space and students for this lackluster start to his Antiochene teaching career. While Suetonius portrayed teaching in one's home as a common and comfortable context, preferable to most of the alternatives, Libanius saw his relegation to his house as a significant loss in prestige, and determined to reenter the more public sphere. All teaching places were not equal to Libanius, and he understood the location of his classroom to speak strongly to the quality of his teaching and his rhetorical ability, which in turn reflected his own relative position of authority within the city. Libanius again emphasizes the importance of place when he relates that he fell into a despondent depression about his humble classroom until an elderly man reminded him that if he wanted his fortune to change, he needed to teach in the public eye, preferably at "any of the temples," where many were "thirsting to learn" (Or. 1.102). "In this," Libanius says, "I did not listen to the elderly man, but having changed a certain one of those from the agora to another part of the complex, I went down and settled myself there, touching the agora" (1.102). In other words, Libanius seems to have persuaded someone to relinquish a place in the busy agora so that Libanius himself could teach there. Not only does this pericope demonstrate the significance of civic space in the context of gaining public recognition and authority, but it further elaborates on Libanius's understanding of the city and the role of education. By highlighting that his new classroom was "touching the agora," Libanius implies that this city square represented an urban center that granted him the respect and wider audience that he was seeking. He comments that "this site (chōrion) did a lot" to double the number of his students, although he still laments that others had the advantage of teaching in the mouseion (1.102). While Libanius attributes the course of his life to Fortune (and sometimes to the Muses and the gods), he nonetheless recognizes that he was actively engaged in a struggle with people he considered to be his rivals. In his autobiography, he regularly speaks not only of the places that he taught, but also of his rivalries with other teachers, with whom he competed for students, fame, and classrooms. Jorit Wintjes notes the lineage of Antioch's rhetors, and that Libanius had earlier experienced more severe rivalries in Athens. When Libanius returned to Antioch, he expected the sophist Zenobius to acknowledge the returning sophist as his successor, but Zenobius retained his position, so that Libanius found himself at odds with some of the other teachers in the city, and was soon in the midst of heated competition over students. In his autobiography (e.g., Or. 1.90) Libanius portrays a mutually hostile relationship with another teacher, identified by such scholars as A. F. Norman, P. Wolf, Cribiore, and Wintjes as Acacius from Caesarea (e.g., Or. 1.156-59). Libanius pleaded with Calliope for assistance from his position in the stoa, and soon thereafter, he found his rivals vanquished, and he brags with pleasure: "I had been established in the bouleutērion and . . . there was such a flock [of students] that it was not possible to get through them all before the sun set" (1.104). Cribiore concludes that Libanius "ruled over a student population that reached eighty in the best years," and reminds readers that when he taught in the city hall he had at least four assistants, though he rarely mentions them. Thus, having begun with a small classroom in his home, Libanius surpassed his rival Zenobius and regained the power and prestige of place that he had been granted upon his earlier visit. Libanius understood his classroom to reflect his ability and status, with better classrooms bringing more students in a cycle that continuously benefited those who were already on top. Libanius demonstrated clearly the influence that went hand in hand with teaching in the bouleutērion, as his acquisition of the official teaching chair and its associated classroom helped make him the spokesperson for many of the city's citizens (Or. 1.107). Libanius thus became a key figure in the patronage networks of Antioch, although Wintjes cautions that Libanius's influence in Antioch was due not only to his position as rhetor, but also to the status of his family in recent generations in the city. Libanius does not hesitate to mention that such behavior by the citizens of Antioch upset his main teaching rival, presumably because of the authority that it demonstrated Libanius held in the city by virtue of his new post (1.109). The end of Libanius's autobiography provides a fitting conclusion to his earlier efforts to gain control of the lecture hall in the bouleutērion, as illness eventually confined him at home. Libanius describes his distress at his adult son's injury, the death of his son's mother, and his own growing illnesses, claiming that the events were so debilitating to him that he could not even be moved on his bed; yet, despite the personal tragedies and physical failings, he rejoices at his ability to speak and teach as well as he had before: "As a gift from the gods, words remained in my mouth as earlier" (Or. 1.280). He notes that it was no longer necessary to go to large halls such as the bouleutērion in order to fulfill his duty to his students, because "students came from many places" to hear his orations in his house (1.281). In this narrative, the politics of place have come full circle. Whereas upon his return to Antioch in 354 Libanius craved access to the bouleutērion as a way of affirming his prestige and granting himself greater authority and visibility within the city, by the end of his career, he portrayed himself as a sufficient attraction to bring students to the more modest place of his own home. By the end of his life Libanius was content to teach from home, because his home no longer held the same connotations as it had when he first returned to the city. As the location and classroom of the city's well-known sophist, his home at the end of his career commanded the respect associated with him and his teaching; no longer did he rely primarily on a prestigious place to bring students to his lectures, but his own renown brought prestige and students to whatever place he taught. Because Libanius's negotiations of the power dynamics of Antioch's places come to us through his written texts, the critical analysis of sociolinguists such as Miriam Locher offers insight into the processes by which Libanius negotiates power through his manipulation of his and others' attendance at Antioch's places. According to Locher, "Power cannot be possessed like a commodity: it is constantly negotiated in and around relationships," and efforts to exercise power are always open to resistance. Sociolinguists recognize that most relationships interweave space, status, and education as components of power dynamics. Libanius and the emperor Julian negotiated in Antioch, for example, and although Julian's status as emperor is superior to Libanius's status as a citizen, Libanius's seniority over the younger Julian and his status as a sophist compared to Julian's role as a student complicated the power dynamics between the two. Reading Libanius's autobiography through the lens of sociolinguistic descriptions of the exercise of power and resistance further highlights the place-related negotiations of power that Libanius undertook, particularly with respect to representatives of imperial authority. An incident with the praetorian prefect Strategius demonstrates the political clout that Libanius claims to have wielded. First, Libanius explains that Strategius requested of him a panegyric, which alone reflects Libanius's high standing. More notably, Libanius announces that he would only deliver the requested panegyric to the prefect "if Strategius left his house and received the work in the bouleutērion," a behavior that Libanius explicitly comments "was something new for the prefect to do" (Or. 1.112). Strategius (Strategius Musonius) was already well acquainted with Libanius, and had years earlier succeeded in persuading the Athenians to offer Libanius a chair of rhetoric, which Libanius refused after noting what a great honor it was to be invited (1.81-86, 106). Furthermore, Libanius suggests that he had spent a great deal of time with Strategius in Antioch, taking advantage of the prefect's respect by obtaining his leniency in legal matters for those Antiochenes whom Libanius wished to be indebted to him (1.106-8). The incident of Libanius's panegyric for Strategius, and the sophist's insistence on its performance in his lecture hall, thus participated in a long history of patronage and exchange between the two men. For Libanius, there was great power in his successful persuasion of the prefect to attend the lecture hall. Not only did this likely mean that a larger and more diverse crowd might attend, thus leading to the greater circulation and wider acclaim of his work, but it also demonstrated his ability to encourage particular behaviors of this government official, indicating even more clearly Libanius's authority generally, and his status with respect to the prefect specifically. In addition to the personal influence that this event reveals, it also confirms the significant power inherent in the location where Libanius regularly taught. More than a classroom for students, the lecture hall in the bouleutērion was a grand and public place associated with civic authorities and host to the emperor's spokesperson in the region. Finally, not only did Strategius's requested attendance reinforce the authority that Libanius and his classroom held in the public eye, but the event of the lecture itself became a new piece of the classroom's history, adding to the collective memory of that place and the connotations that passersby would associate with it ever after. Not one to miss an opportunity, Libanius recounts about Strategius: "He said he would do the honor, though most did not believe, but indeed he was present," and when the length of the work made it necessary for him to return a second, and even a third, time, he did (Or. 1.112). Taking full advantage of the situation, Libanius persuades the prefect to attend Libanius's lecture room not only one time, but three, as if to flaunt the sway that he held over this official both in persuading him to appear in his classroom and in controlling the powerful place that commanded such respect. Libanius explains with pleasure in his autobiography that soon everyone in the city respected him, having heard not only about the incident and who it involved, but also specifically "where in the city" it took place (1.112). Libanius's manipulation of the praetorian prefect Strategius provides an example of what Richard Watts defines as the "exercise of power." When Libanius claims that he persuaded Strategius to break with custom (and Strategius's initial intention) and to hear the panegyric in the city hall instead of the prefect's house, Libanius portrays himself as exercising power over the praetorian prefect. By declining to resist Libanius's request, Strategius positioned himself under Libanius's power, despite his status as praetorian prefect. Stewart Clegg observes that people "'possess' power only insofar as they are relationally constituted as doing so," and Libanius here narrates his resistance to Strategius's exalted position, renegotiating through language and physical attendance the relative power between these two men. Throughout his autobiography Libanius relates other similar examples in which he affects the behavior of a government figure, choosing where to stage his appearances so as to lend himself prestige. Libanius mentions, for example, a certain well-respected Archelaus who honored him. Libanius claims that Archelaus intended to visit him, instead of vice versa, which would have been customary, and that the visit never took place only because Libanius asked him to remain where he was, thus exercising power in changing Archelaus's stated intentions (Or. 1.166). Physical location becomes a key factor in this complex power exchange. To begin, the story suggests that both Libanius and Archelaus understood it to be a mark of authority for Libanius to receive Archelaus as a guest, rather than having Libanius be the visitor. The architect Vitruvius from the first century B.C.E. noted that people of higher status always received at their homes visitors of lower status, but the opposite was not true (De architectura 6.5). Through the retelling of this story, Libanius demonstrates not only that he was worthy of Archelaus's intention to visit him, despite Archelaus's high status, but in the vocabulary of Thomas Wartenberg, Libanius had "power over" Archelaus in constraining his actions by persuading him to change the visit, showing Libanius's ostensible influence over where this notable figure did and did not go. Libanius follows this account with a series of examples of the power dynamics involved in his ability to visit, decline to visit, and host local rulers. He comments that Protasius, the consularis Syriae, was told by some of his followers "that he would be a really bad governor if he did not bar his doors to me" (Or. 1.167). In his autobiography, Libanius rhetorically dismisses Protasius's apparent refusal to see him, suggesting that he would not have visited Protasius in any case (1.168). The advice to Protasius as well as Libanius's response acknowledge that it was not without significant meaning that Libanius or a local ruler might visit or refuse one another. If Protasius exercised his authority to refuse to host Libanius, as his advisers suggested, Libanius nevertheless narrates the story to suggest that it was he who withheld his attendance from Protasius because they were not on friendly terms. A series of similar narrations follows. Protasius's unnamed successor also engaged in power contests over visitations, according to Libanius, who records that the official "hoped for an invitation to [my] orations," but Libanius invited others and demonstrated that he "had no great need" of the official (Or. 1.169). Libanius describes the consul's anger at this slight, and his effort to punish some of Libanius's students unjustly, presumably in an effort to demonstrate the force that he wielded in the face of Libanius's suggestion that Libanius's authority was not subordinate to that of the consul. Libanius elsewhere in his autobiography refers to an Antiochene governor's unhappiness over a custom (nomos) that prevented him from visiting Libanius at his home (1.211), as well as to Libanius withholding attendance from Proclus, the comes Orientis, and the virtue that Libanius felt that his refusal had demonstrated (1.223-24). In each case, Libanius presents himself as engaged in negotiations of power with a government official through attendance at, or resistance to invitations to, particular places. In a similar encounter that recalls the struggle with Strategius, Libanius writes that following the emperor Valens's death at Adrianople in 378, Libanius and others in Antioch celebrated the nomination of Hypatius, who was in Antioch at the time, as the prefect of the city of Rome. After all the other speakers had presented their addresses, it was time for Libanius to present his oration, and he claims that Hypatius wanted his speech to be presented where the new prefect was, in front of a small audience; Libanius, however, wanted it to take place "in the bouleutērion" so that many people could attend (Or. 1.180). Although in this case Hypatius does not seem to have granted Libanius's request, the story represents another example of Libanius's efforts-at least in the rhetorical self-presentation in his autobiography-to manipulate his power and prestige vis-à-vis local rulers through his command over the locations of his speeches, his attendance, and the attendance of others. A story that Libanius recounts about Eubulus, and Eubulus's influence on Festus, the proconsul Asiae, suggests that Libanius was not alone in recognizing the dynamics involved in such acts of attendance. Libanius claims that once a crowd had gathered to hear him in his lecture hall when the proconsul Festus tried to disperse them by calling them to hear a letter from the emperor, demonstrating his exercise of power over those who were subject to the authority of his position by threatening them if they did not attend (Or. 1.157). Norman observes that the council members' need to hear the reading of a letter from the emperor resulted in an act that "removes the cream of Libanius' audience from his declamation." Libanius claims that Festus even posted people at Libanius's lecture to record the names of any who did not attend the summons. Libanius reconciles himself to Festus's success in using his role as a representative of the emperor to take these members of Libanius's audience by describing the audience as unwilling to leave, even though they felt that they had no choice but to do so (1.157). Although Festus took the initiative in this story, according to Libanius, the proconsul was directly influenced in these actions by Libanius's rival Eubulus. Each of these stories of Libanius's interaction with a government official in Antioch leaves no doubt that Libanius narrates these events with a keen awareness of the power inherent in places, and in attendance at those places. As with local rulers, Libanius also demonstrates his authority in urban space when the emperor Julian visited Antioch in 362-63. Libanius praises Julian's adherence to ancient traditions, in sharp contrast to the orator's clear disdain for Christians and Christianity's rejection of traditional practices, values, and education. Libanius's pleasure in Julian's accession to the throne is clear in his praise of Julian's love of wisdom and his restoration of traditional practices (Or. 1.118). Libanius conveys his personal joy at the rise of someone who valued education and the classical heritage as Libanius himself did: "I laughed and leapt, and put together and gave my speeches with pleasure, as the altars received blood, smoke carried the savor of burnt sacrifice to heaven, the gods were honored through festivals" (1.119). Julian's reign had such restorative possibility for the empire in the rhetoric of Libanius's memories that Libanius claims that Romans took courage from Julian's accession to the throne, and the barbarians suffered (1.119). Despite such praise, however, Libanius claims that his own authority in the city of Antioch had grown to such a level that he could successfully persuade the new emperor where and which events the sophist would attend. Libanius narrates a struggle with Julian that Libanius ostensibly won in defining the terms of his attendance at particular places in Antioch. Libanius's autobiography establishes Julian's allegedly great admiration for Libanius upon the emperor's first approach to the city, which, along with their long history of respect for one another, set the stage for Libanius's boldness in the interactions that soon followed (Or. 1.120). Libanius relates that every day the emperor would sacrifice "under the trees in the garden of the palace, and many came regularly" to participate in the service to the gods (1.121). Libanius explains his reticence to attend Julian's sacrificial rituals, offering the excuse that he had never been invited and would not attend simply in order to flatter the emperor (1.121). Thus, Libanius was drawing further lines about where in the city and in what circumstances his status would allow him to go. In particular, Libanius's reticence to attend the emperor without an invitation led to his absence from the sacrificial altars that Julian used. In light of his celebration that under Julian "the altars received blood, smoke carried the savor of burnt sacrifice to heaven, the gods were honored through festivals" (1.119), it is questionable whether Libanius would have avoided the altars primarily because of an objection to the sacrifices themselves. His language suggests that much like his authoritative insistence that the prefect Strategius attend an oration at the place of Libanius's dominance, so too in this case Libanius's choice not to frequent Julian's altars was an assertion of Libanius's decision to avoid compromising his standing. Hans-Ulrich Wiemer also interprets Libanius's actions with respect to Julian in the weeks following his arrival in Antioch, as narrated in his autobiography, as a bold effort to demonstrate his independence and status, although Wiemer plausibly suggests that Libanius was not always withholding his presence from the emperor from a position of authority, as Libanius claims. Glen Bowersock notes of Libanius's choice not to attend: "Libanius acted from a proper sense of his own dignity and station (and possibly a recollection of the similar way in which the great second-century sophist Aristides had behaved toward Marcus Aurelius)." At least in Libanius's retelling, altars became sites for the negotiation of status, even in relation to the emperor himself. Libanius's struggle with Julian continued to escalate during Julian's stay in the city. "Once [Julian] came to sacrifice at the altar of Zeus Philius," Libanius says, "and he saw the others, for they wished and would do anything to be seen. I alone of all of them was not watching" (Or. 1.122). When Julian wrote to Libanius to ask why he had not attended, Libanius sent his reply, explaining his absence from Zeus's altar in the same way that he explained to his reader his absence from the daily sacrifices in the palace garden, that he had not received an invitation. The emperor's reproof was apparently not sufficient to effect Libanius's attendance, as he claims that by choice even after this exchange he still "kept away from the garden" (1.123). According to Richard Watts's model, Libanius would "possess power" if he "has the freedom of action to achieve the goals [he] has set [himself], regardless of whether or not this involves the potential to impose [his] will on others." By exercising his freedom of action in withholding his presence, Libanius reveals the ability to negotiate the status that he possesses in relation to the emperor. Resistance is, according to Wartenberg, "the attempt by the subordinate agent to change her circumstances in regard to the dominant agent so as to diminish the dominant agent's power over her." By resisting Julian's expectations of his attendance, Libanius rejected the emperor's presumption of control, and in the process renegotiated the power dynamics between them. The honor eventually granted by the emperor's official invitation to Libanius, with the emperor ostensibly forced to request the favor of Libanius's presence, finally resolved the issue. Locher describes the power of "action-restriction" in relation to Wartenberg's comment that a powerful figure "changes the social space of the agents over whom she has power." In the Antiochene example, Libanius "strategically constrains" Julian's "action-environment" by persuading Julian to change his behavior by issuing a formal invitation if he would like Libanius's attendance. By orchestrating an event at the agora, one of the most important public places in the city, Libanius allegedly overturned the expected influence of the emperor over a citizen: "I was invited as the agora became full, and [the emperor] who had invited me was at a loss and hung his head to the ground," indicating to Libanius that the emperor regretted his earlier poor behavior and ceded control of the situation to Libanius (Or. 1.123). According to Wartenberg's model for power dynamics, Libanius would "influence" Julian "if and only if" Libanius"communicatively interacts" with Julian in such a way that, as a result, Julian "alters his assessment of his action-environment in a fundamental manner." When Julian reconsidered and issued an invitation to Libanius at the sophist's insistence, Libanius demonstrated influence over the emperor in the context of those particular negotiations. Libanius's narration of the emperor bowing his head in respect to the sophist in the midst of the crowded agora paints a very public display of Libanius's high standing and the prominent places in which he received imperial recognition. Libanius claims that he put off his attendance not only at the emperor's ritual sacrifices but also at the emperor's table until he received an invitation. Even once the emperor invited Libanius to join him for a meal, Libanius continued to negotiate, as he declined the emperor's first and second invitations, only to have the emperor request that he visit often (Or. 1.124). Part of the power inherent in an invitation lies in its potential to be refused, and thus the one who is invited is able to assert control over the one who offers the invitation. By carefully delimiting where he would and would not go, and under what circumstances, Libanius highlights the political force that attendance in particular locations could have, and he describes himself as successfully constructing spatial boundaries in order to demonstrate his status with respect to the emperor Julian. These actions in turn increased Antiochenes' perception of Libanius's power, as he claims that when Julian left the city in anger in 363 they chose Libanius to plead their case to Julian, in part because they considered Julian to be Libanius's student (15.6). Julian himself also recognized the significance of withholding his presence, and wielded this same power against Antioch after he felt that the city had unforgivably insulted him and the gods. The citizens of Antioch so offended Julian that he claimed he would not return to their city. In his infamous satirical work, the Misopōgōn, Julian insists, "I determined to depart and withdraw from this city [Antioch]," disgusted by the corruption and frivolous life of luxury preferred there, and insulted by the citizens' treatment of the emperor and of the gods (Misopōgōn 364-65; cf. Libanius, Or. 15.55). As Emmanuel Soler and others have recognized, Julian shared an educated disdain for Antiochenes' alleged love of spectacle and pleasure, criticized also by others who knew the city well, including Libanius, Ammianus Marcellinus, and John Chrysostom. Offended by the behavior of Antioch's citizens, Julian recognized that withholding his presence from the city was an effective form of censure and a demonstration of his strength, much as he closed the Great Church to censure the Christian communities in 362 after the fire at Apollo's temple. Libanius's pleas on behalf of Antioch's citizens demonstrate that the full force of Julian's behavior was apparent to his audience (Or. 15.55-56). Imagining the impending disaster that would follow, Libanius laments that Antiochenes would be rejected around the world and have to conceal the place of their origin (15.57). As a result, Libanius found himself in the weakened position of extending an invitation to the emperor, one he knew well might be refused: "What I ask . . . is that you do as you did, Emperor, making the second [trip] resemble the first stay. Marching from the west you were with us; stay now also, returning from having been victorious" (15.14-15). These texts confirm that both Libanius and Julian recognized the power of controlling their public appearances, and the authority that the places in which they appeared could confer. This competition adheres to the same pattern as Libanius's struggles with his rival teachers to gain students, demonstrating Libanius's attention to and control over where and with whom he went. Teachers such as Libanius were, however, far from the only fourth-century Antiochenes competing to gain control of the city's best teaching places. Antioch's Christian leaders struggled to gain control over church buildings much as Libanius competed for students and classrooms with his rival teachers. By the fourth century, Constantine's patronage helped Christianity to flourish around the empire, although the new political climate also led to ecumenical councils, beginning with the Council of Nicaea in 325, that limited the possibilities of who could legitimately claim to represent "orthodox" Christianity. Shifting political patronage and corresponding imperial definitions of Christian orthodoxy in the decades that followed also brought competing claims to episcopal sees around the empire, but few places more so than Antioch. Concurrently, Antioch was a center for church councils, Olympic games, and emperors themselves, as the imperial palace in the city was intermittently occupied by Constantius II, Julian, Jovian, and Valens. In this complex landscape, Antioch's Christian leaders competed not only with those of other religious communities but also with each other to gain control of the city's powerful preaching places and its citizens' attendance at them. A brief overview of the shifting control of Antioch's churches will reveal the possibilities for fruitful Christian comparisons to Libanius's skirmishes, and will thus lay a foundation for the in-depth analysis in the following chapters. As seen in the introduction, fourth-century Antioch was rife with intra-Christian divisions, fueled by the political and theological controversies around the empire, especially from the Council of Nicaea (325) to Theodosius's issuing of the cunctos populos edict (380). During these decades, Antioch's population had choices between multiple concurrent Christian leaders, for a time as many as four different bishops, and even more numerous places where they could gather to hear these leaders preach. Possession of the most desirable place, whether the bouleutērion or the Great Church, was a matter of imperial appointment. Nevertheless, just as Libanius competed with other teachers to claim the most prestigious lecture hall as his classroom, and just as doing so facilitated his acquisition of a much larger audience and greater number of students, so too Christian leaders vied to control the most powerful preaching places, and could expect that control over those places to aid the spread of their version of Christianity to more people, and the growth of their congregations. Theodoret, who grew up in Antioch, records an intra-Christian conflict over places that recalls Libanius's negotiations with the praetorian prefect Strategius. Theodoret's story involves a conflict between Leontius, the homoian bishop of Antioch from 344 to the late 350s, and two ascetics who were later ordained into the priesthood by Bishop Meletius-namely, Flavian and Diodore. Theodoret claims that Flavian and Diodore "gathered together the lovers of God's works in the dwellings of the martyrs, praising God with them in song the whole night" (HE 2.24.9). According to Theodoret, Bishop Leontius interpreted these actions as a challenge to his authority. Recognizing that "the multitude was extremely well disposed toward these excellent men," Leontius "did not consider it safe to try to hinder them, but . . . he required from them that this ministry (leitourgian) take place in the churches" (Theodoret, HE 2.24.10; cf. Sozomen, HE 3.20.9). Just as Libanius understood there to be a powerful significance in his ability to request that the praetorian prefect attend him in his own classroom, so this story suggests that Bishop Leontius thought that he could retain his authority over Antioch's Christian community if the charismatic ascetics led their followers in a place that was clearly under the bishop's control. For Libanius and Bishop Leontius, the location of the public performance was critical to the negotiation of the power dynamics among the participants. Theodoret's fifth-century description suggests that Christians like himself, and possibly Leontius, Flavian, and Diodore, recognized the spatial politics of authority. Another fifth-century church historian, Sozomen, also wrote Antioch's history in ways that echo some of Libanius's stories. He notes, for instance, that when Athanasius of Alexandria visited Antioch during the episcopacy of Leontius, he found the Nicene Christians who opposed the homoian Antiochene bishop gathering "in private houses," and asked the emperor Constantius II to provide one of the church buildings under Bishop Leontius's control to the Nicene community (HE 3.20.4). Regardless of the historical accuracy of Sozomen's text, the parallel between Libanius's narrative of his struggle to move from teaching in his home to a place in the agora to the prestigious bouleutērion, and Sozomen's account of Nicene Christians' struggle to move from worshipping in a home to a small church building to the Great Church, reveal the familiarity of such spatial narratives and the assumption that there was a direct relation between location and power. This comparison can be carried even further by considering Sozomen's claim that years later Bishop Meletius's followers "caused him to mount the episcopal throne (thronos) in one of the churches before the city" upon his return from exile (HE 7.3.3). Much like Libanius's thronos in the bouleutērion, the thronos of Sozomen's story explicitly signifies the authority-in this case the episcopal authority-of the person who sits in it. The five tumultuous years of 359-64 provide the most concentrated example of the shifting imperial patronage of Christian leaders in the schisms following the Council of Nicaea, and of the local changes of episcopal fortune and control that accompanied them. Meletius's almost immediate exile after his appointment as bishop in 359/60, and the election of the homoian Christian Euzoius to replace him, created two stark Antiochene Christian communities, each of which had been granted an imperially supported bishop within the year. With Julian's accession to the throne in 361 and his recall of all exiled bishops, both Euzoius and Meletius were in residence in Antioch, along with Paulinus, who had been appointed bishop just before Meletius returned. Meletius hosted a council in Antioch under the emperor Jovian (r. 363-64), but Jovian's successor Valens returned imperial patronage to Bishop Euzoius later in 364. Much as the bouleutērion was rightfully the lecture hall of the city's appointed sophist, the beautiful Great Church of Antioch became the domain of the imperially recognized bishop and his congregation-both were prominent and respected public places that were closely associated with imperial power. In the midst of the complex politics of the years 359-64, the Great Church changed from homoian Christian control since the time of its dedication in 341 under the emperor Constantius II (r. 337-61) to Meletius's brief control upon his appointment around 360 to the homoian bishop Euzoius's control after Meletius was quickly exiled. When Meletius returned to Antioch under the emperor Julian by 362, Euzoius appears to have maintained control of the Great Church for the homoian community for a time, but lost control of it again to Meletius late in 363 when Jovian became emperor. With Valens's accession to the imperial throne months later in 364, the Great Church returned to Euzoius, and Meletius was exiled again, although he and his successor Flavian would regain control of the Great Church with the accession of the emperor Theodosius fifteen years later. 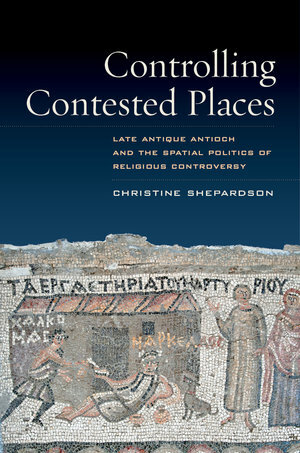 It is easy to understand how this political chaos, church schism, and shifting control of the Great Church could have led Meletius and his followers John Chrysostom and Flavian to take a particularly active interest in shaping the physical topography of Antioch in the decades that followed, and in creating (and controlling) powerful new Christian places that would not shift as easily from the control of one Christian community to another, regardless of changing imperial support. The Great Church, though, was not the only significant Christian meeting place in the fourth-century city, and just as Libanius reports his advancement from teaching in his own home to teaching in a room on the edge of the agora to teaching in the bouleutērion itself, so, too, Christian leaders in Antioch moved from one location to another for a variety of reasons. While some moves were ritually necessary, such as Bishop Flavian preaching at a martyr's shrine on the day of the celebration of that martyr, other moves were not voluntary, such as those forced by the exile of Bishop Meletius. As noted in the introduction, when the emperor Valens exiled Meletius in 365, Meletius's congregants lost control of the Great Church, and it appears that in this period they did not have access to any of the city's church buildings, as Theodoret records that for a time the community gathered to worship at the foot of Mount Silpius and then in the military training grounds across the Orontes River (HR 2.15, 2.19). While Antioch's rhetors and sophists do not usually seem to have competed directly with the city's Christian leaders for the same places, teachers and preachers alike competed among themselves to gain control over the places that held the greatest prestige, and thus influence, within their community. Just as the end of Libanius's autobiography exemplifies, however, that the values of places were not static, there are comparable Christian examples. Although the bouleutērion was a prestigious place, and Libanius's home did not initially hold much value as a classroom in the city, by the end of his life Libanius narrates that this had changed: his own prestige as a renowned teacher turned his home classroom into a place that attracted numerous students because of his presence there. Likewise, although Antioch's Great Church held prestige within the city as the ornate and impressive new church built with imperial patronage, other buildings could become significant places if something or someone powerful inhabited them. John Chrysostom records, for example, that many Antiochenes, even some who attended Chrysostom's church services, considered the Jewish synagogue to be a fearsome place, in part because it housed the sacred scriptures (Jud. 1.5; 6.6). During the fourth century, martyrs' relics became extraordinarily powerful objects that brought religious authority to the places where they were located. Thus occasionally teachers and preachers alike could increase the prestige of a place, rather than being forced to change their location to a place that already had greater potency in order to raise their status. This increased respect for a place could thus convey greater authority to the leader who controlled it, a dynamic that Bishop Meletius found particularly useful in the face of his forced exile from the city's church buildings. The most dramatic example of this, which will be discussed more fully in the following chapter, is the decades-long manipulation of the relics of the early Christian saint Babylas, and Bishop Meletius's appropriation of Babylas's relics to grant greater authority to a new structure that he built to house them. The intentional relocation of Babylas's relics in order to reshape the connotations and relative power of places in and around Antioch connects the Christian story to Libanius's also through the involvement of the emperor Julian. Whereas Libanius depicts himself engaging with the emperor in a complex dance around the offering and acceptance of invitations, and thus controlling his and the emperor's attendance at particular places, John Chrysostom also describes Christian leaders engaging with Julian over the manipulation of places and the influence associated with them. Thus, during the same months that Libanius was allegedly involved in delicate spatial negotiations with Julian, raising Libanius's own status by refusing his attendance at Julian's invitations, Julian was involved in much more explicit manipulations of the region's topography, exhuming Babylas's bones from the grounds of Apollo's temple to regain control of that place for the Greek god, wresting it away from Christian control. While Julian successfully forced the removal of the remains from the temple grounds, he was unable to lessen the power associated with the relics. Whether teaching Greek rhetoric or Christian orthodoxy, whether struggling against their most immediate colleagues or with the emperor Julian, whether seeking to gain control of already potent places or seeking to make more potent the places that they already controlled, these Antiochene leaders reveal the power that was at stake in fourth-century Antioch through the reshaping of physical places. Antioch's role in imperial politics during the fourth century, as well as the complexity of its religious history and the wider influence of the city's church leaders, made it particularly significant to the development of the definition of Christian orthodoxy in the eastern empire, as well as to the erratic spread of Christians' influence and visibility around the Mediterranean in late antiquity. Amid this complexity, Antioch's teachers and preachers recognized the importance of controlling local places that were associated with status and authority, and actively manipulated them in their favor. Libanius returned to Antioch in 354, hoping that his years of education and teaching would garner him recognition and prestige in his hometown, such as he had received on his recent visit to the city. He expresses disappointment and frustration that upon his return he was at first able to attract only small numbers of students, and that he was forced to teach them in his own home, since he did not have access to more public teaching places in the city. In particular, he writes at length about his yearning to teach in the most prestigious place in the city, where he had spoken so successfully on his visit. When he finally earned the appointment to the official chair of rhetoric, and the right to teach in the bouleutērion, he provides further information about the location itself, its impressive size, and the official thronos that was set so visibly opposite the room's main entrance and that marked the authority and honor associated with his new post. Libanius's rhetoric reflects a distinct awareness that initially the amount of respect he received as a teacher was directly tied to the location of his classroom, and he narrates in detail his painful though eventually triumphant efforts to move from teaching in his home to teaching in the city's largest classroom. Libanius extends this sense of the importance of physical location into his dealings with imperial officials, and even with the emperor Julian when he was resident in the city. From persuading the prefect Strategius to come to Libanius instead of vice versa, to declining to attend the emperor's rituals, Libanius portrays his careful control over his attendance at the city's places, and in the process manipulates the status of those places, his classroom, and himself. Christian preachers concurrently vied for control in the city, and like Libanius they did so amid a great deal of competition. It seems as if the old Apostolic Church was likely the most prestigious church through the reign of Constantine, but it seems to have been quickly overshadowed by the completion of the Great Church, dedicated in 341 under Constantine's son Constantius II. The schism in Antioch's episcopacy meant that for decades there were multiple distinct Christian communities in Antioch, each with its own bishop, and each bishop anxious to preach in the most prestigious places and thus demonstrate his authority and hopefully win over the rest of the city to his community. Throughout the fourth century each new Eastern emperor gave his support to a different Christian community than the emperor before him, from Constantius II to Julian to Jovian to Valens to Theodosius. Shifting imperial patronage aggravated the internal struggles, as bishops from different Antiochene factions alternately found themselves promoted to control of the Great Church, demoted to control of a smaller church, or exiled altogether. In this chaotic climate, Bishop Meletius and his followers seem to have been active in their efforts to control and define Antioch's urban and rural places, as will be demonstrated in the following chapters. Emmanuel Soler has observed that the project of Meletius and his followers was to make Antioch an exclusively Nicene Christian city. Given the preponderance of evidence for leading figures' recognition of the power of controlling such places, it is likely, as Hanns Christof Brennecke suggests, that Meletius's Christian rivals were likewise engaged in related efforts that unfortunately do not survive as clearly in the extant sources. In some cases, these Christian leaders fought primarily against other Antiochene Christian factions for control of powerful Christian places in the city, in order to be the ones to define Christian orthodoxy in Antioch (and they hoped in the empire). In other cases, these Christian leaders struggled against those who respected the gods to redefine the city's significant places. This overview of the cityscape of fourth-century Antioch, and of the competition to control the city's teaching and preaching places, provides the framework for a closer examination of some of the specific manipulations and transformations that the city's leading figures effected, and the results of those changes for perceptions of religious orthodoxy. From constructing new buildings to describing rival-controlled areas as morally and physically dangerous, leaders in late antiquity fundamentally shaped their physical environment and thus the events that unfolded within it. Controlling Contested Places maps the city of Antioch (Antakya, Turkey) through the topographically sensitive vocabulary of cultural geography, demonstrating the critical role played by physical and rhetorical spatial contests during the tumultuous fourth century. 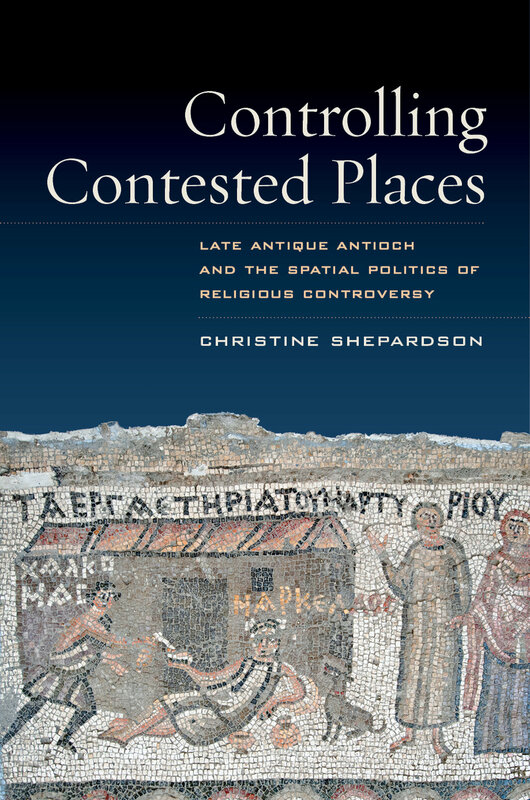 Paying close attention to the manipulation of physical places, Christine Shepardson exposes some of the powerful forces that structured the development of religious orthodoxy and orthopraxy in the late Roman Empire. Theological claims and political support were not the only significant factors in determining which Christian communities gained authority around the Empire. Rather, Antioch’s urban and rural places, far from being an inert backdrop against which events transpired, were ever-shifting sites of, and tools for, the negotiation of power, authority, and religious identity. This book traces the ways in which leaders like John Chrysostom, Theodoret, and Libanius encouraged their audiences to modify their daily behaviors and transform their interpretation of the world (and landscape) around them. Shepardson argues that examples from Antioch were echoed around the Mediterranean world, and similar types of physical and rhetorical manipulations continue to shape the politics of identity and perceptions of religious orthodoxy to this day. Christine Shepardson is Associate Professor of Religious Studies at the University of Tennessee, Knoxville. Christine Shepardson interviewed by the Ancient Jew Review journal.